is a cultural and recreational mecca. People flock to Sarasota and Manatee counties for our beaches—after all, Siesta Beach’s acres of sugar-white sand earned it the title of America’s No. 1 beach in 2011. But they stay for the arts and culture, the tropical ambiance, the almost endless opportunities to keep active, and our warm, welcoming and beautiful neighborhoods. Whatever your lifestyle or life stage—be it young family, busy entrepreneur or active retiree—you’ll find something to keep you busy, and somewhere perfect to call home. The Olympic pentathlon qualifying events will be held here in 2014. And our boys of spring training, the red-hot Baltimore Orioles and Pittsburgh Pirates, take over Ed Smith Stadium and McKechnie Field each March. 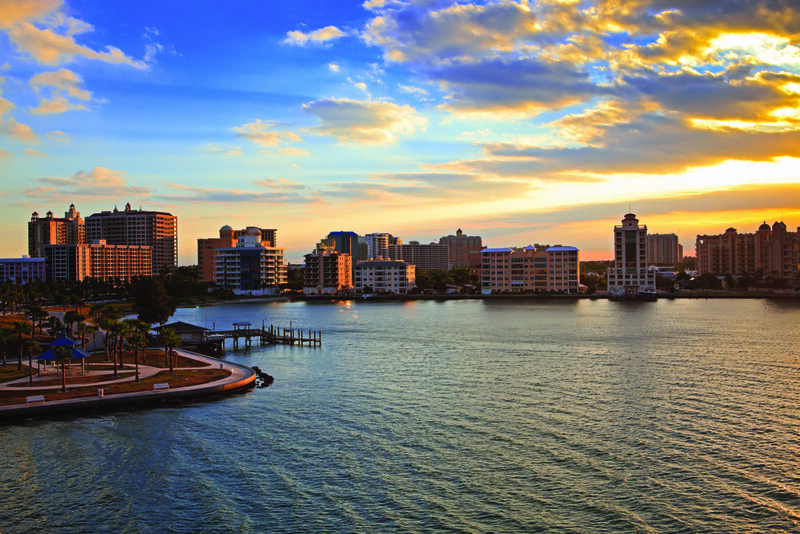 But you don’t have to be a pro to participate in the area’s many free family beach runs, join the throngs walking the Ringling Bridge across a stunning span of Sarasota Bay, or sign up for a guided hike through one of the county-owned conservation preserves. Catch a Sunday afternoon match in season at the Sarasota Polo Club, go for a bicycle spin on the 10-mile Legacy Trail or play a round on one of our 86 golf courses—1,548 holes of golf, if you’re counting. Thanks to our international appeal, you can even play competitive cricket and petanque. The landmark Van Wezel Performing Arts Hall, designed by Frank Lloyd Wright’s Taliesin Foundation as a purple seashell set along the bay, brings Broadway touring shows, as well as stars of the worlds of pop, jazz and classical music. The John and Mable Ringling Museum of Art, with art galleries, circus museum, Historic Asolo theater and Ca d’Zan mansion spread across 66 bayfront acres, has a well-deserved national reputation, as do the Sarasota Opera, Sarasota Orchestra and Sarasota Ballet (the focus of yet another glowing New York Times profile late last November). And you can tread the boards yourself at our three strong amateur community theaters, the Players, Manatee Players and Venice Theatre. When you want to get away from it all, experience “the real Florida” at Myakka River State Park, at 57 square miles, the largest in Florida’s state park system. (You will see gators; we guarantee it.) Historic Spanish Point in Osprey has 30 pleasant bayfront acres to ramble. Right downtown, the Marie Selby Botanical Gardens has a world-renowned orchid collection and a brand-new Children’s Rainforest Garden. Get up close and personal with sea life at Mote Marine Laboratory and Aquarium, or rent a kayak and explore the mangrove tunnels off South Lido Beach. And did we mention that our sugar-white beaches—34 miles of them alone in Sarasota County—are second to none? So, ready to jump right in? Let’s find you a neighborhood. When the master-planned community of Lakewood Ranch began development in the late 1990s, it changed the face of east Manatee County forever. Perennially included in Top 10 lists of America’s best master-planned communities, Lakewood Ranch is now home to more than 18,000 residents who live in 8,500-plus homes in dozens of neighborhoods surrounding nature preserves and parks. This “live, work, learn and play” community is also home to a medical center, public and private golf courses, shops, restaurants, a major commerce center and even a polo club. Sixteen top builders all have met Lakewood Ranch’s rigorous standards to be invited to build here. In 2013 alone, Taylor Morrison introduced the Ranch’s first “active adult” community, Esplanade Golf and Country Club just north of S.R. 70, with an eventual 1,250 detached villas and single-family homes; and Lennar introduced Bridgewater, a neighborhood of upscale manor and estate homes. Building continues also in the neighborhoods of Country Club East and Central Park, and Canada’s Mattamy Homes recently announced plans for a 675-unit development. Just up I-75, WCI Communities is developing Tidewater Preserve on the Manatee River, and Neal Communities is building the first phase of Eagle Trace, with 182 home sites. Lakewood Ranch spurred a development boom in east Manatee County, and several country club communities are located nearby, including Lennar’s River Strand Golf & Country Club in the master-planned community of Heritage Harbour, and Rosedale Golf & Country Club, which recently introduced its newest 221-unit single-family subdivision, The Links. Manatee County has its fair share of other golf communities, of course, including the venerable 1920s-era Sara Bay Country Club, where an early match between the world’s greatest amateur golfer, Bobby Jones, and the best professional, Walter Hagen, is the stuff of legend. Newer clubs include Palm-Aire Country Club, The Concession, River Wilderness Golf & Country Club, University Park Country Club and Waterlefe Golf & River Club. But it’s really made its international sports reputation as the home to IMG Academy, the behemoth training center for top professional and amateur athletes. (Among the famed alums are tennis players Andre Agassi, Boris Becker, Monica Seles and Maria Sharapova and golfer Paula Creamer.) Just as Lakewood Ranch transformed east Manatee County, IMG has brought an international presence and youthful vitality to southwest Manatee County as affluent families from all over the world come here to enroll their children. Arthur Rutenberg Homes, John Cannon Homes and Gibraltar Homes are building custom luxury homes at nearby Legends Bay. Just as it did during the go-go years of the early 2000s, when 7,000 homes were built in just six years, the once rural east Manatee County town of Parrish is experiencing another building boom. Medallion Home is building Twin Rivers, a single-family community on 1,800 acres between Gamble Creek and the Manatee River. Neal Communities’ single-family River’s Reach, set on the headwaters of the Manatee River off Rye Road, is under way. Homes by Towne is planning 1,600 single-family homes, attached villas and multifamily homes in Eagle Pointe. And Neal Communities last year announced plans for the 2,000-home Villages of Amazon South, named for the huge Amazon distribution center being built just over the Hillsborough County line. At press time, the company was awaiting rezoning hearings. In 2013, TripAdvisor once again named Anna Maria Island a Traveler’s Choice Destination winner and Forbes named it the third-prettiest city in the country for a reason: The Gulf-front community retains its old-fashioned Florida charm. A free trolley that runs the length of the seven-mile island is an excellent way to get a feel for the “sand in your shoes” sensibility of the three little cities, Anna Maria, Holmes Beach and Bradenton Beach. No big developments here, but remodeling and new construction are taking place. Just off the island on Anna Maria Sound, Minto Communities is creating Harbour Isle, a gated community of Southern coastal resort-style homes.